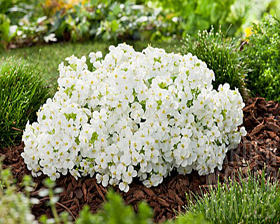 Arabis grandiflora is a dwarf, mat-forming evergreen perennial with soft deep green leaves that form ground-hugging rosettes. Masses of 12cm wide clusters of white flowers are borne on short stems from April into summer. A well grown specimen can be covered in hundreds of flowers which are sweetly scented and long-lasting. Perfect for rock garden or for trailing over the edges of containers, over stones or down walls. Sow in early autumn for flowering the following spring, or in late spring for flowering the following year. Sow arabis seeds on the surface of the compost; do not cover as the seeds need light to germinate. Seal in a polythene bag until after germination which usually takes 14 to 21 days at 18 to 20°C. Seeds can also be sown directly in open ground.